Time Without Time logo design and typographic lock up. 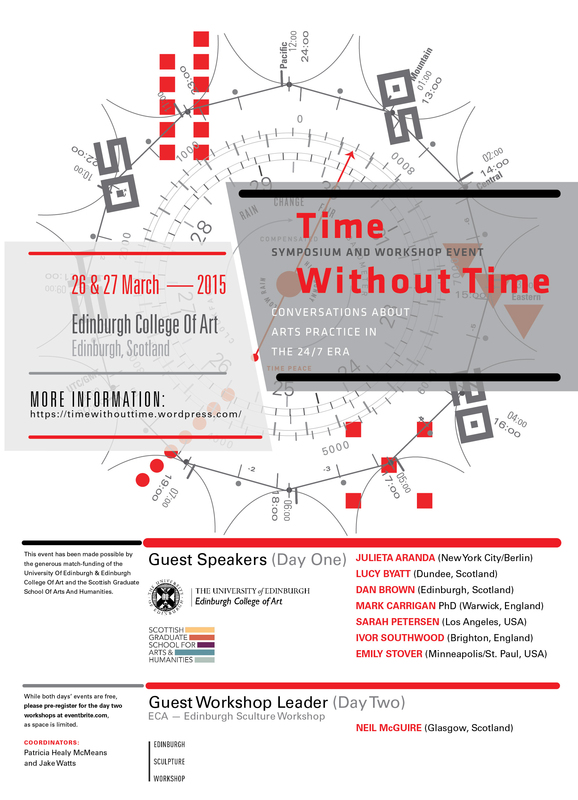 Time Without Time brings together interdisciplinary artists, practitioners, academics, and writers from across the USA, UK, and Europe to be involved in generative discussions, each one being considered to fit together as complementary parts of a whole conversation. We will be welcoming guests Julieta Aranda (New York/Berlin) from eflux, Dan Brown (Edinburgh) from Edinburgh Sculpture Workshop, Lucy Byatt (Dundee) from Hospitalfield Arts, researcher and author Mark Carrigan, PhD (Warwick), artist designer Neil McGuire (Glasgow) from GSA, artist and writer Sarah Petersen (Los Angeles), artist designer Emily Stover (Minneapolis/St.Paul), author Ivor Southwood (Brighton), and others tba. Coordinators: Patricia Healy McMeans and Jake Watts, artists and current practice-led PhD researchers at Edinburgh College of Art investigating contemporary art practices in situated learning, specifically Residencies and Workshops, respectively. Original clock face graphic was created in 2007 while studying for my MFA at the Maryland Institute College of Art. The graphic was created as a three (3) colour [white, mid-gray, red] clockface and verso screen printed onto vinyl records. The records were then heated manipulated and formed into 3–D bowl like objects. There was a series of seven working clocks with clock parts mounted to the centers of each molded record. Screen printing on vinyl records was a series of alternative print media explored in graduate school. Another similar project in the series, printed Apples + Oranges, typographic designs. The reuse/recycled graphic seemed like an appropriate design option for the Time Without Time symposium. 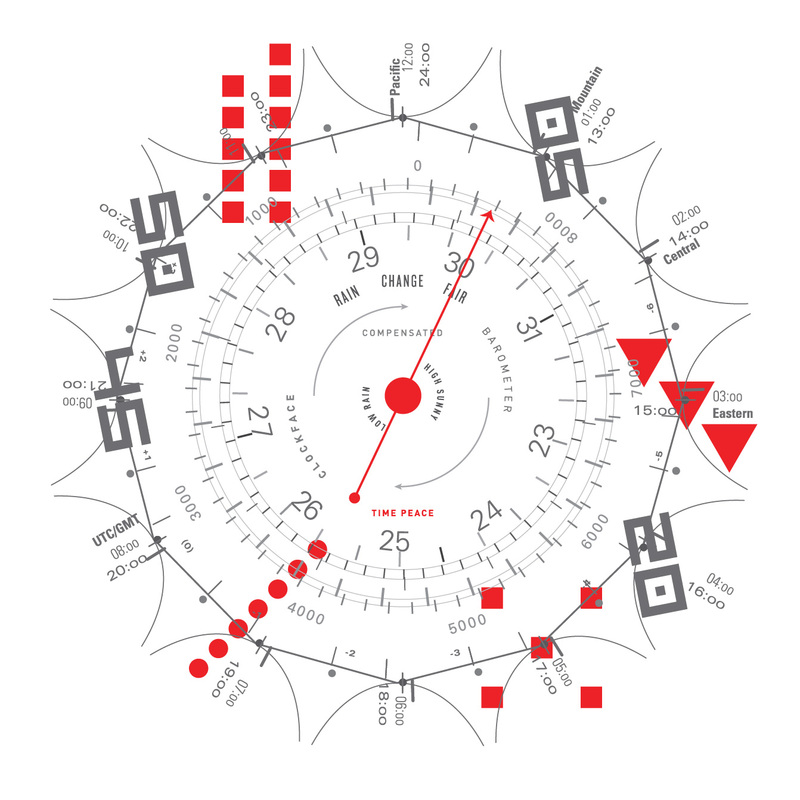 While alternative designs were created, the time peace clock face design seemed to share much of the conceptual criteria. The clock face graphic was intended to collage elements of time, barometer, diagrammatic gauges & dials, alternative mathematics, time zone(s), digital & analog clock designs. The symposium on time challenges concepts of artists’ time; the perception of time and monetary principles of time and value.